Infections by bacteria and yeast are the most common ear problems that occur in pets. Pets with ear infections have redness and a discharge around or in the ear. The color of the wax will vary from yellowish (often a bacterial infection) to brown/black (often yeast or ear mites). The ears frequently have an odor and the area may be swollen. Pets will scratch at their ears and shake their heads. 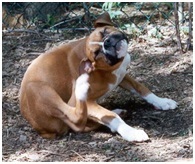 If they are scratching enough, they will have crusty areas, sores, mats, or hair loss around the ears. In chronic cases, the canal may be almost swollen shut. Some pets will be feeling a lot of pain. If the infection has extended deeper into the ear, your pet may have a head tilt, flickering eyes, or have a loss of balance. Thankfully, this is not common. Diagnosis of the infection is usually not difficult. Swabs of the ear canals are taken and examined under a microscope. Parasites, bacteria, and yeast can be seen. The ear is examined with an instrument called an otoscope to see deeper into the canal. Your vet will want to see if the tissue is thickened, red, bumpy, or if there are lumps or foreign objects (e.g. grass awns) present. The vet will also try to look at the eardrum to make sure it hasn’t been ruptured. If it’s ruptured some cleaning solutions and medications should not be used. However, it isn’t always easy to see the eardrum. When there is a lot of wax and debris in the ear, it often is in the way. Your vet may want to do some blood tests to see if hormone problems are contributing to the problem. Food or environmental allergies are the most common underlying cause in dogs. 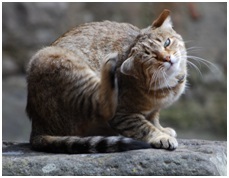 Ear mites are the most common cause for cats, but they can also have allergies. Anything that causes inflammation and irritation in the ears can lead to ear infections, including pulling the hair out, using cotton swabs to clean the ears, and even a reaction to medications. 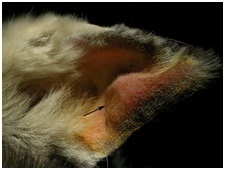 Polyps, benign lumps common in cats, and tumors in the ear can cause irritation as well. Your veterinarian will provide the appropriate antibiotic, antifungal, or steroid treatment necessary to clear up your pet’s infection. However, treatment starts by clipping the hair away from the opening to the ear and pulling out any hair that’s down into the canal. Most of the time, the ear is then cleaned. Under certain circumstances, your vet may want to treat for a few days before cleaning the ear. Cleaning is an important part of treating ear infections. The discharge present in ears makes the medicine less effective. Ask your veterinarian what ear cleaner to use. The type depends on the type of infection your pet has and if the eardrum is intact. Using the wrong one can make things worse. When pets have recurring infections, it’s because they have an underlying problem that wasn’t removed or the initial infection wasn’t completely cured. Since allergies are one of the more common causes, it’s important to check for them. Your pet will often need oral medication for the infection on top of drops or ointment and a frequent cleaning regimen. In some chronic cases, it will take months of treatment to clear up the infection. You may need to treat your pet indefinitely. This is more likely if there is an underlying problem you can’t control. 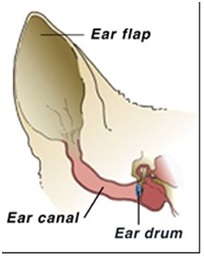 The surface of the ear canal is thin and often easily damaged. Don’t pull the hair out of your dog’s ears if he’s not having problems. Don’t use cotton swabs for cleaning. Pets with normal ears don’t need to have their ears cleaned. If your dog is a swimmer, a drying solution used afterwards can help prevent problems. Look inside your pet’s ears regularly. Any wax buildup can mean the start of a problem. Catching it early will help you get it under control more easily.